All Things Dog Blog All Things Dog Blog: Pet Auto Safety Giveaway! I hope by now you've all read my review of the three wonderful products to be given away by Pet Auto Safety. What's my favorite part of this giveaway? You get to choose the solution that works best for you and your dog. Whether you'd like to seat belt Fido into the back, provide a console barrier or a complete barrier of the center section, you've come to the right place. With 2 dogs following me around on many errands, trips to mom's house and other outings, we know the importance of making sure they're locked in securely before we hit the gas. I'm pleased to be helping a few of you travel safer as well. If you don't find yourself in a mood to play the entering game, feel free to check out these products at their website, where you can purchase them yourself. It's quick and painless. In fact, for those of you who prefer the 'sure thing' method of getting your dog's travel safety buttoned up, you can take advantage of PetAutoSafety.com's Discount Code: petsafeblogger, on orders at their website. This Discount Code saves you 10% and applies exclusively to harnesses, all pet car barriers and car seats. You may also enjoy visiting Pet Auto Safety at their Facebook or Twitter pages to get better acquainted or ask questions. Dawn will be happy to assist. Many owners who allow their dogs to ride up front on the seat do this unknowingly leaving their dog in potential danger. Airbags are extremely powerful and can easily kill or seriously injure a dog in the front seat. Some newer model cars offer an on/off switch, while others engage when weight is placed on the seat. Raised car seats are the only safe method of front seat transportation in cars with airbags that cannot be turned off, and these only work for pint-sized pups. Please keep this in mind as you make choices for transporting your dog. The Rafflecopter entry form is below the social media icons at the bottom. If you don't see it, simply click on the post title to refresh and it should reappear. Entries will continue through 12:01 AM, Monday, May 21. The winners will be announced that night. Good luck to everyone! Full disclosure: Pet Auto Safety provided us with a seat belt to properly fit Oliver for crash-tested safety in the back of my car. I am highlighting this and some other products offered by this online pet safety supplier at no cost to them, and I have not been paid to provide my opinion or this review. The prizes given away are provided by the sponsor. No purchase is required to enter the giveaway that is coming soon. I prefer the harness and seatbelt for keeping my dog safely in the back seat. I toured the Pet Auto Safety website and in addition to the seatbelts and barriers, I liked the car window screen, the backseat bridge, and the small dog booster seats. What a great website she has! Mom makes me sit in the very back of her CRV, with the back seat up. She has yet to find a harness that fits my giant self & that works in that back area, but it looks like the Bergan XL just might do the trick! I hope I win!! pee S. Mom can't find where to comment on the Pet Auto Safety website. I prefer the car seat in the front of the car along with a harness. 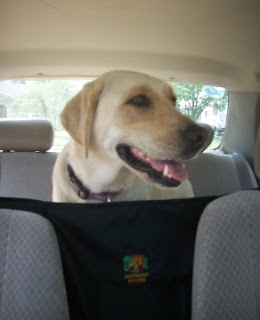 I definitely like the pet net barrier as my dog does not ride well in the backseat and tries to climb up front. I would want the front seat barrier for Murphy. He is so horrible in the car...this would really help. I think the front seat barrier. I really like the Breeze Guard Car Window Screens but I am not sure where to comment on their website. Carrie, if here isn't okay, please guide me to where you would like us to comment. Thank you! I love the Breeze Guard Car Window Screens are really interesting, what a great idea. I also didn't see a place to make a comment. I love the Breeze Guard Car Window Screens. I would like to see some better photos of some of the other products. Some of them are intriguing too. Molimo wears a harness so she would be comfortable in one, but I think I might like the front seat barrier best. I think we would be best with a front seat barrier. My neighbor's car has something like the Breeze Guard Car Window Screens built right into the car. I've always liked them for her dog Wonka. The would be great if they fit right. I use a seat belt harness to keep my dogs secure and out of my lap. My girlz have carseats! We belt them in the back! I don't know if this is where we are suppose to comment about touring your website but I couldn't fine anywhere to comment on the actual site. Since I don't know I also posted this comment on the facebook page. I am glad I have found your website just for pet safety in the car! I look at a lot of different pet supplies sites and always check out the Travel section. They never have a really good selection. Now that I know of this site I can find all that I need there. I especially love the Kurgo Car Dog Guards. I have a dog that likes to stick her nose out the window from time to time and also drools a lot. That product would be perfect! So many goodies to choose from :) I like the car seat for my little chihuahua. He is a little guy who gets anxiety in the car, and for his safety I have to keep him in a car seat. I really like that small dog booster seat would keep him safe!!! I would use a seat belt and harness or a raised car seat. I don't drive and I usually hold my dog(s) in the passenger seat with me or they sit in the floor board while I hold one and wait their turn. If it's one person driving the dogs to the groomer, they each have their own crate/carrier and they go in the backseat. I need the seat belt harness because 88 lb dogs don't fit in a small dog pet seat. The backseat barrier would be great too. I learned that **Only the manufacturers of the Bergan, Kurgo Tru-Fit, and PetBuckle dog car harness brands have provided testing information regarding safety, strength, and fit. @Trish B.: Shiver...that's so sad. I'm glad you found this post and share your story. I'd like to see more pet owners look out for Fido in the car. Hey! everyone, this is Dawn with PetAutoSafety.com. Thanks for all the great comments! I'm not sure what's up with my Facebook pages or why it won't let you leave comments. Feel free to email me directly at naturebydawn@aol.com or naturebydawn@gmail.com. You can also check out my blog at www.petautosafetyblog.com and leave comments there. We use a seat barrier right now, but even before that, we never had a problem with the dogs jumping up front unless there was an empty seat because one of us went in somewhere. I'd like to get them seat belts because it's safer. I like the large My Pet Buddy Booster seat - I didn't realize that there were car seats big enough for Midget. It is an informative post. It is an interesting information.I really love this. I toured the website and found two products that really interested me that I didn't know they had for my size dog! 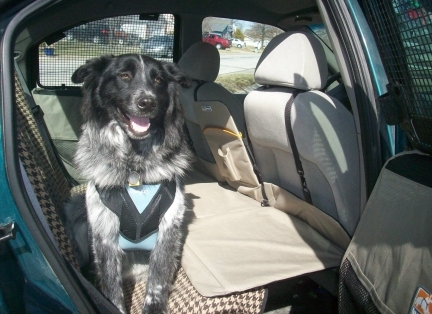 The Roll Around Travel Pet Carrier (Large) and the Lookout Perch Pet Car Seat - Half Bench! So excited to find these two products! Christine Aiello, this is Dawn with PetAutoSafety.com... I'm glad you like the products! :0) I just want to mention that even though the Roll-Around is for a larger dog, when it sits upright the bottom space is only about 15 x 12 inches square. It has to sit upright for it to harness into the car so consider that sized space. I think the The Pet Net Brand Car Safety Barrier is interesting. I need something like this. Even though my dogs wear seatbelts they find ways to loosen the adjustments and like to poke their faces or try to get up front (of course they cant) many of the barriers ive seen like this are simply not tall enough because they dont cover the area above the seats. This one looks great. I prefer the seat belt harness. I learned that only the manufacturers of the Bergan, Kurgo Tru-Fit, and PetBuckle dog car harness brands have provided testing information regarding safety, strength, and fit. I also learned that the extra small Tru-Fit Smart dog car harness is the smallest Kurgo size yet. It can be adjusted to fit a tiny 'tea cup' sized dog between 5 and 10 pounds. For neck size 9"-13", chest size 14"-18". This is awesome!! I didn't know they made a harness for tiny dogs. I'm so excited!! I learned to think about the tiny debris that can cause injury to the dog's eye or nose. Having them secured in the car with the window is safer and they will still get the same whiffs. My preference is the seatbelt harness! I learned that a barrier that keeps your dog in the back of a vehicle - such as the back of a minivan or SUV - is safer for your dog, especially in the event of an accident. It can prevent your dog from escaping and running away from fear, especially if injured. I use a car seat for my long-haired Chihuahua. My bigger dogs are in the back (hatchback with seat down). I could use the barrier, though. I hadn't seen the hammocks before. Not sure that would be very useful with a young, active dog, but it is an interesting item. I prefer the seat barrier. I love the Breeze Guard Car Window Screens. We have to keep the windows up because when we are driving I don't want any bugs or anything fly into their eyes or mouth. I have never seen anything like the Breeze Guard Car Window Screens. Very Interesting and great for the dogs to have a breeze in the backseat. I prefer pet safety harnesses. They keep your pets from becoming a dangerous projectile during an accident, and from jumping into your lap causing a major distraction. The best part is, they can still enjoy the view! The window covers sound amazing for dogs that enjoy the breeze but still keeps them safe. I prefer a seat barrier! I found The article on the seven reason why your dog should wear a pet auto sear belt very interesting. I posted the link because I think all pet owners should read and think about it. I think the harness would work great for me!! My mom loved the Skybox Pet Booster Seat for me! She loves how I could still be contained and safe but look out the window!! I really love the variety of pet auto safety products they offer - everything from booster seats to seat belt harnesses, to portable bowls and water bottles for dogs! The Breeze Guard Window Screens are awesome! I've never seen them before. I always worry that my pup is going to try to jump out of the window, so we don't roll them down all the way for him. I have been wanting to get Bentley a car seat for the longest! I ride in a car seat with my harness clipped to the seatbelt. It takes 70 pounds to turn on the airbag, I am only 13.5. I see the seat I use on their site. The Snoozer Lookout II. I also have the travel rack for food and water! I learned that the company is located in Lawrence, Kansas. I prefer a seat belt harness.